Participants at the January IOD training included senior officers from some of the largest local and multinational companies in Thailand. In late January, more than 30 senior officers from 17 major Thai and multinational corporations attended an intensive anti-corruption training program led by the Thai Institute of Directors (IOD). This pilot two-day training course is the latest groundbreaking step in the Collective Action against Corruption campaign, now in its third year, being led by CIPE and IOD. With technical and financial assistance from CIPE, IOD has assembled a still-expanding coalition of companies and business associations committed to fighting corruption in Thailand. To join this coalition, a company signs IOD’s Collective Action against Corruption Declaration which lays out tangible and specific steps that a company must take to proactively reduce corruption-related risks on the part of its employees, managers, and vendors. But signing this document is no mere photo-op, because to remain a member of this coalition, a company must submit to an external evaluation to verify whether or not it is actually doing what it has promised to do. This private sector anti-corruption coalition now consists of the largest companies operating in Thailand, both Thai and multinational corporations, along with the country’s most influential business associations. CIPE and IOD estimate that this coalition represents over 15 percent of the entire Thai economy and more than 1 million employees. Survey data gathered at the outset of this initiative revealed significant demand from the Thai business community for technical training on anti-corruption strategies. 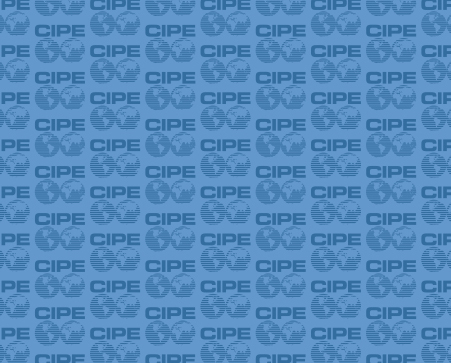 To meet this demand, and to help companies comply with the standards of this collective action coalition, CIPE and IOD developed a series of anti-corruption training programs for coalition companies and companies looking to join the coalition. IOD held six one-day workshops for corporate directors and executives over the past year, drawing rave reviews from participants which included the leaders of such companies as Thai Airways, Siam Cement, and PTT. To complement this course, which IOD continues to run, IOD developed a separate two-day course to train corporate compliance officers and internal auditors on how to use a company’s existing internal control structures to mitigate corruption risks. Participants also receive instruction on the certification process which a company must undergo in order to remain in the anti-corruption coalition. CIPE and IOD worked with PwC and other prominent experts to develop new and unique technical content for this course, which is the first of its kind. This late January event was the first full pilot for the new course, and IOD was overwhelmed with requests to attend, despite the significant time commitment for senior corporate officers. And for the first time, IOD charged an attendance fee, which companies were more than willing to pay. The fact that companies must make real commitments in terms of time and resources in order to join this anti-corruption coalition is a testament to their dedication to fighting corruption in Thailand. By establishing uniform standards of conduct to which companies must adhere and by facilitating the sharing of information on anti-corruption experiences and best practices, the Collective Action against Corruption campaign is leveling the playing field and increasing transparency and accountability in the Thai marketplace. In a country in which allegations of corruption have contributed to dramatic political upheaval, this project is directly contributing to the consolidation of democracy in Thailand. Corruption has long been an issue in Thailand. But until CIPE and IOD launched this collective action program in 2010, anti-corruption efforts in Thailand focused exclusively on public sector reforms, such as strengthening anti-corruption regulators, tightening conflict of interest laws, reforming public procurement regulations, etc. Those initiatives that did seek to involve the private sector were merely informational disclosure requirements for businesses mandated by the government, such as additional paperwork that must be submitted by tender participants. CIPE’s program with IOD is demonstrating that businesses are not only interested in reducing corruption, but they are willing and eager to be mobilized to take concrete steps to fight it. John Morrell is Program Officer for Asia at CIPE.